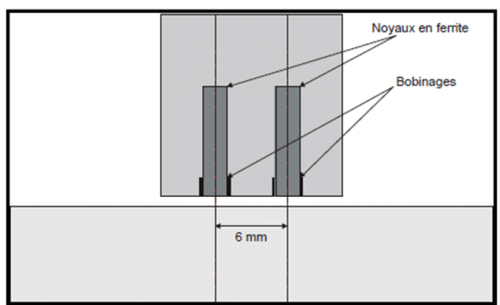 A flat plate in inconel, 1.55 mm thickness, is inspected by two coils, as it is represented on figure below. The plate material, the inconel, has a conductivity of 1.02 MS.m-1 and a relative permeability of 1. This study implies a probe made out of two coils operating in separate functions and absolute measurements, that means in "Reflection mode". 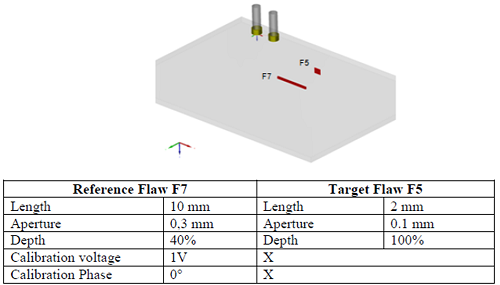 Geometrical features of the coils including a ferrite, as well as their positionning, are described on figures below. Features of the coils constituting the probe with separate fonctions. The comparison is carried out on the flaw called « F5 » on figure below, une small through notch of 2 mm lentgh and 0.1 mm aperture, after calibration on flaw « F7 », notch of 10 mm lentgh, 0.3 mm aperture, situated at 40% of the plate thickness. The signal is setted at 1V amplitude and 0° phase on calibration flaw. A specifical surface model (Boundary Element Method), more efficient and more accurate than a volume model for thin flaws has been used in this study. Both tables below gather calibrated results for the « F5 » calibrated flaw at 100 kHz and 300 kHz. The figure on the bottom of this page shows results curves obtained with CIVA and the experiment. A good agreement is observed between simulation and experiment. 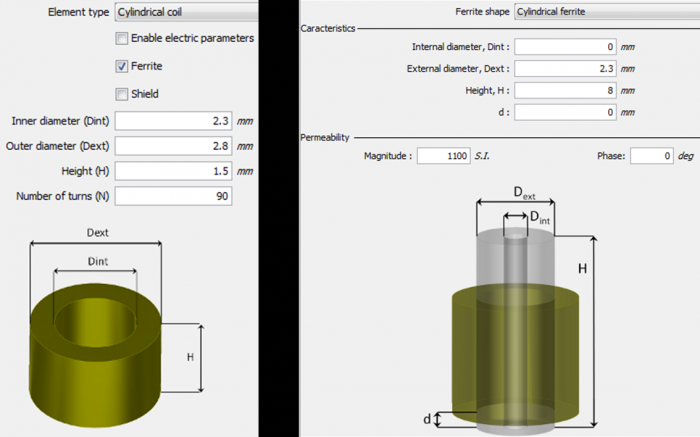 These results are taken from the article Working Group COFREND "Eddy Current NDT modeling": benchmarks for validation and improving simulation codes acceptation presented to the ECNDT in 2014.